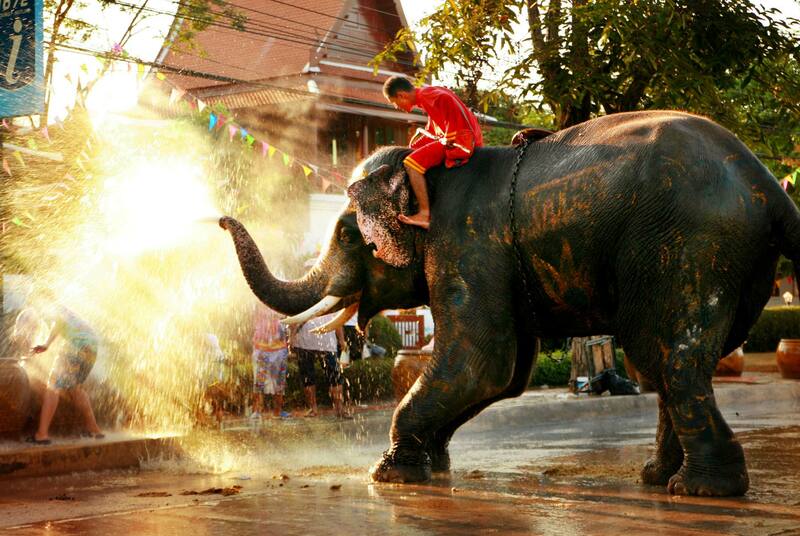 Probably Thailand’s most well know festival, this three-day celebration marks the Thai New Year. You’ve probably seen scenes of revelry as whole streets are shut to traffic to allow giant water fights. It’s a lot of fun to take part in and a spectacle unlike any other to behold. It’s also an important part of the LGBT+ calendar, with pool parties galore and plenty of opportunities to get wet and wild! However, the modern festivities stem from a tradition of visiting temples to offer food to the monks, and to pour water onto statues of the Buddha. This act reflects washing away one’s sins and bad fortune, and purifying the spirit for the year to come. Known as Phi Ta Khon, this colorful festival remembers the story of Buddha, in a previous life as a prince. In the tale, the prince is presumed dead as he had been away from his kingdom on a long voyage. However, when he returned alive and well, the ensuing festivities were so flamboyant and loud they were said to have awoken the dead. Nowadays, the celebrations include a parade where locals wear colorful and creative ghost masks and outfits. The three-day celebration takes place between March and July, in the Dan Sai district of Isan, North East Thailand, and includes dancing, games and drinking. This festival of light is held every year around November. As night falls, locals gather around the riverbanks to buy beautifully handcrafted Krathong – floating baskets traditionally made of bamboo, embellished with flowers, candles and incense sticks. You can even customise them by adding a personal keepsake or a few coins, to gain merit. The baskets are lit and sent off down the river – it’s a spellbinding sight to see thousands of them floating away, sending away the misfortune of the past and carrying a wish for the future. This unique festival takes place just north of Bangkok in the province of Lopburi. The remains of the temple of Phra Prang Sam Yot play host to an unusual feast where all the diners are simian – macaques to be precise, and over 2000 of them who live there. Food and drinks are laid out, including statuesque towers of tropical fruit, for the monkeys to devour in the hope that the offering will bring good fortune to the people of Lopburi. For visitors, there’s a dance performance to kick off the feast, and food stalls selling delicacies for humans, so you don’t have to compete for a set with your monkey friends! 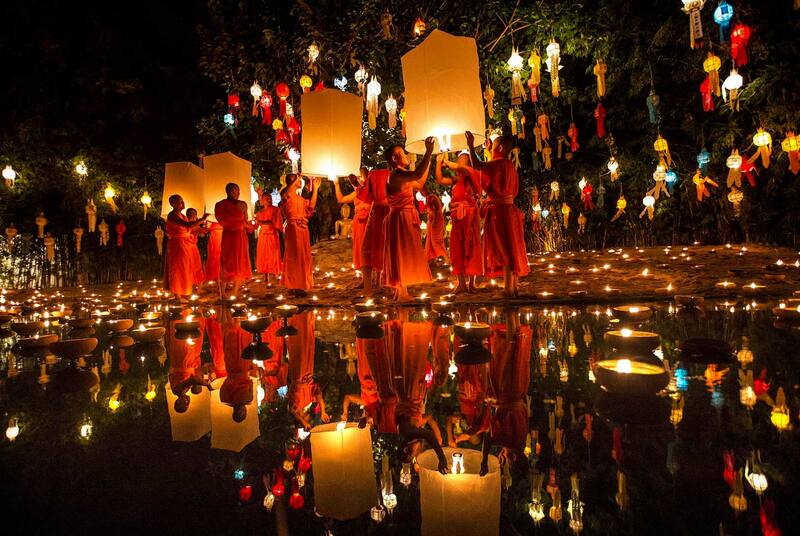 Floating lanterns originate from the Lanna people of northern Thailand, and you can see them being used as part of celebrations, festivals and rites at all times of year. You’ll find the most spectacular displays at the Yi Peng festival (around the time of Loy Krathong) in the northern capital of Chiang Mai. Thousands of lanterns are lit and released into the air, meandering up into the atmosphere, in the hope of obtaining merit from the Buddha. However, nowadays lanterns are commonplace and are available throughout the country. It’s a truly magical experience to light one and feel the hot air pressure building up, then releasing it (along with your wishes) into the night sky.